When Politics and Business-as-usual Fail to Act… | Small Farmers. Big Change. 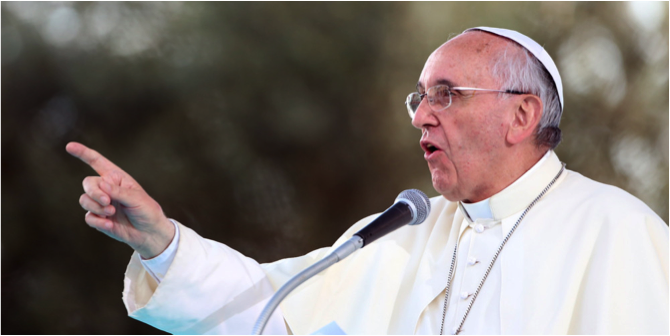 During Pope Francis’ much heralded visit to the U.S. last week, he gave top priority to the pressing issues of economic disparity and injustice, and the threat that climate change poses to humanity and to the planet. In his speeches before Congress and again at the United Nations, Pope Francis urged world leaders to take the threat of global warming seriously and to act quickly to take steps to reduce the greenhouse gases that contribute to this crisis. He also talked about the ways in which climate change disproportionately affects the poor and reminded us that those of us in the North need to shoulder the burden of responsibility to address this crisis. Politics and business (as usual) have indeed been slow to react. And this is why it is up to us…. progressive businesses, workers, activists, engaged citizens… We know from history that change happens from the bottom up and that vested interests (in this case, the fossil fuels industry) never willingly give up power or their economic interests. Equal Exchange has joined a growing number of organizations that are working to build a citizen movement to stand up to these interests and say No to the fossil fuel economy and yes to a clean energy future. Just like the apartheid movement and the anti-tobacco movement, thousands of voices (and our dollars) can make a difference. Click here to read about our Climate Justice Initiative and please click here to add your name to the thousands of people taking the Divest-Invest pledge. Please sign the pledge today!